"Spurstange einstellbar universal, 9.00 in. bis 10.50″ Länge, 3/8″ Spurstangenkopf, Stahl"
Adjustment Spacer Rod Length (in): 7.000 in. Adjustment Rod Minimum Length (in): 9.000 in. Adjustment Rod Maximum Length (in): 10.500 in. Rod End Thread Size: 3/8-24 in. Rod End Head Bore Size: 0.375 in. Rod End Ball Width: 0.498 in. 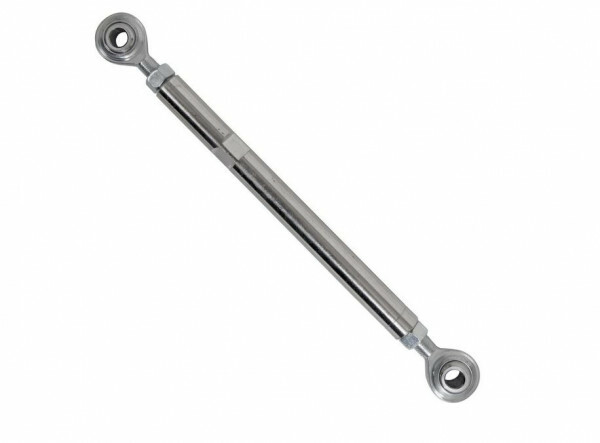 Summit Racing® adjustment rod assemblies are constructed of durable, long-lasting cadmium plated steel and are available in a variety of lengths for your specific auto applications. Shop Summit Racing® parts for outstanding performance, value, and quality.